In 2016, I seriously hope you're not side-stepping leave-in conditioning as a part of your healthy hair regimen. Leave-in conditioners are like, everything. When you have a good one, it does exactly as the name suggests -- conditioning the hair post-wash, while softening, de-frizzing, retaining moisture, and sealing the cuticle of the hair. Leave-ins are also a part of the secret sauce of a great wash and go style. They help capture your curl pattern in it's most hydrated state, helping your curls ascend to epic levels of washing and going. Yes, another rock star leave-in conditioner form 2014 makes its way onto the 2015 roundup! Whipped Curls is a true curl primer -- boosting curls with a super thick dose of glycerin, shea butter, olive oil, and green tea extract. It's a bit pricey, but because it's so thick and concentrated, a little bit goes a long way -- especially if applied under running water to dilute it. Seriously, the 8.5oz whipped cream inspired canister lasts forever. It helps tremendously to de-frizz, packs tons of moisture, and doesn't weigh the hair down. Plus, when combined with my DIY Mud Rinse, it's the perfect product for a conditioner only wash and go! When it makes the list 2 years in a row, you know it's real! The Eden BodyWorks Coconut Shea Leave-In is super thick, has tons of slip, and coats the hair gorgeously. The first ingredients after water are aloe vera juice, coconut oil, jojoba oil, and safflower seed oil, so you know what time it is! I highly recommend this one for anyone suffering with super dry hair that's looking for a leave-in. It's also the perfect leave-in for those of you who have a curl definer that makes your curls pop, but leaves them dry as a bone. It's the perfect buffer! Why: No lie, it was by a very narrow margin. I almost considered awarding both Soultanicals Mango Dip Detangling Slip and Eden BodyWorks Coconut Shea Leave-In Conditioner...but then that would violate the spirit of the Deserted Island Award. It was an incredibly tough call, guys. Both leave-ins smell amazing, are similar in consistency, provide amazing slip and moisture, and hit every other mark I love in my leave-in. The ingredients in both are awesome, and I've kept them both equally in rotation all year long. I had no choice but to declare Eden BodyWorks Coconut Shea Leave-In Conditioner the winner based on two factors alone: price and on the ground availability. The truth of the matter is, Eden BodyWorks is $7-8 cheaper than Mango Dip (both are 8oz) and is sold everywhere. Heck, I could probably even get some Eden BodyWorks on that deserted island. What leave-in conditioners are winning with you into 2016? Let me know in the comments below! Check out all of the 2014 Christina's Choice winners here! 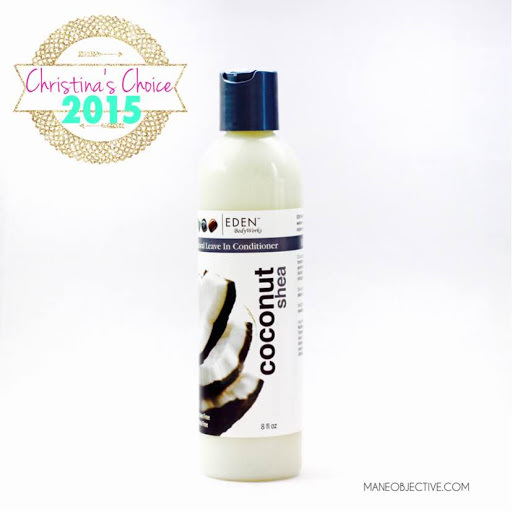 Keep up with the Christina's Choice 2015 winners here! I confess, I laughed aloud at that last line at the image of you buying it from some coconut obsessed islander. I can definitely see the availability, as we're seeing it more of our online shops here! I'm excited for the day when it's finally on the ground. What does the EBW leave in smell like? Lol!!!! You and me both! 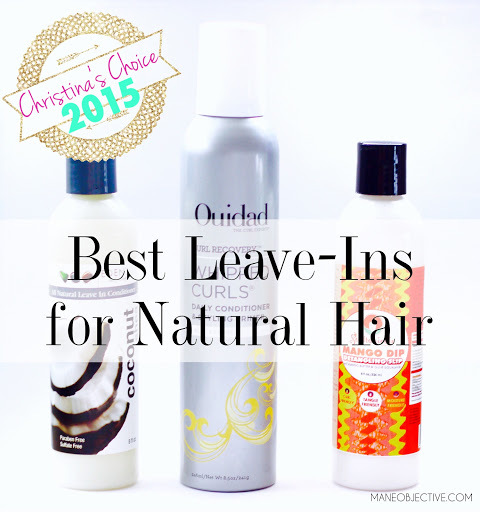 The leave-in has a sweet coconut smell - not too overbearing though. I'm excited for how our products are showing up and showing OUT! I really enjoy reading your blog. Thank you. I have a couple of questions. Did you do a blog on Eco Styler compatible leave-in/ moisturizers? I know you mentioned As I Am, Eden & Soultanicals. Also, I wanted to know if you've tried it with SheaMoisture's Jamaican Black Castor Oil leave-in? I have highlighted / dense/ fine 3c&4a hair and JBCO worked well with Uncle Funky's Daughters Curly Magic. But I'm looking for cheaper gel. Oh my! I need to find a way to make sure my comments don't slip through the cracks. Thank you! I actually have an Eco-compatible leave-in list in my drafts -- this is the extra push I needed to post it ASAP!